On a beautiful Winter sunny morning 16 Canterbury Roaders met at the corner of The Ridge and Canterbury Road for a nostalgic wander around where the original school stood. 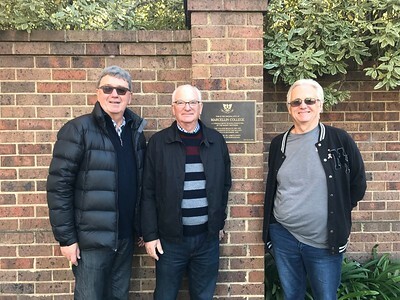 We were very pleased to welcome Kevin Doyle and Richard Hastings, both 'first dayers' all the way through to men from the Peer year 1969. Of course there is nothing left to show of Marcellin's legacy now except a plaque placed on the wall in Canterbury Road near the pedestrian lights. However the men reminisced about the school and buildings, where they used to walk and what they used to get up to. Richard Olive very kindly presented a short and informative talk on some of the history of the buildings and area. We then visited next door which in Marcellin days was the Nurses accommodation (and is now a retirement home). Many of our guests recalled gazing up at the windows to view some of the nurses while sitting in the classroom! The group then walked through the streets of Camberwell to the Railway station (again lots of memories provoked) ending up at a cafe for coffee and cake and lots more chat. Thank you to all of the lovely gentlemen who came along and contributed to the day with their memories and stories. We look forward to meeting more of you at other Fellowship events.